Are you enjoying your popcorn a little more now? OK, I’m going to do an opinion piece now. I think we’re going to see the end of Martha Stewart Living magazine within the next year or two, or at least see it rolled up into something else. If you haven’t heard, the two MS magazines were sold to Meredith, and the company Martha Stewart Living Omnimedia (MSLO) was sold to Sequential Brands Group, whatever that is. I remember when MSLO went public, the shares sold for something like $38 each. I long thought about buying 10 shares, (especially after the price went way down), just to own a bit of it, but I never did. The price of the subscriptions has decreased with the new owners, too. Meredith also publishes, among others, Better Homes & Gardens, Rachel Ray Everyday, Shape, and Parenting. “The change will be invisible to the consumer, and will help to further strengthen the Martha Stewart brand in the advertising marketplace,” said Meredith National Media Group president Tom Harty. No, it isn’t invisible, I saw it. Yesterday I received the April issue, and it didn’t take long to flip through it. On page 22 in the Good Things section is a runner constructed from four IKEA Signe rugs. That’s lovely. . .except I did that ten years ago as a bathroom runner, since the cats liked to drop their midnight hairballs in the bathroom. I stitched them up on the machine (exactly the way they do, lengthwise) using white upholstery thread, and now I have four of them to chose from. Completely machine washable (except I have no more cats.) The From Martha column is all about Martha getting her hair done. This was NOT what Martha Stewart Living was all about. More “church lady” kinds of desserts, and not the kind of thing I’d ever make. I gave it to Neighbor T upstairs, since she’s kind of a “church lady,” and does like that sort of thing. It’s no longer Martha Stewart Living. It’s Better Homes & Gardens 2.0. OK, I’ll quit griping and complaining. For a while. Let’s talk about something more interesting. 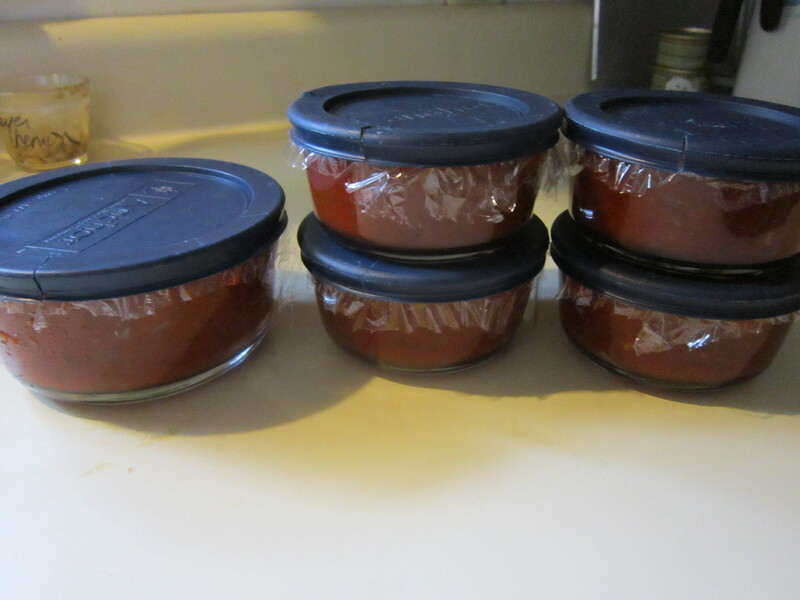 Although I haven’t done a lot of waffling in a while, it’s because I’ve been using the Crock Pots a lot. Now from the company that brings you the Internet-Of-Things slow cooking machine that you connect to your WiFi and control with a smartphone app, and a slow-cooking arrangement called a “Hook Up,” comes this new 5-in-1 Multi-Cooker that bakes, steams, sautes and roasts in addition to slow-cooking. It’s the idea is that not only can you brown your meat before you do the slow cooking, you do it in this appliance, and the one-pot convenience saves time and washing extra pots. It also doubles as a small counter-top oven (I don’t know if it would replace my toaster oven), and you can steam in it too. At $150, I’m not in a hurry to order one. If I were to get one I would probably ditch at least one of my two “dumb terminal” Crock Pots, and maybe bake more in it. (A baking rack is included for things like custards.) I did notice that many of the people writing reviews received a “free sample” to try out. No, I didn’t get in on that one, I wish. Oh, well. I’m not big on buying every single new appliance out there, especially if it does just one thing (like popcorn.) But this might be a good bridal shower gift with wedding season coming up soon. Or a graduation gift for someone who’s heading to college in the fall and likes to cook. Now, let’s talk about waffling. Yes, again. If you haven’t become hooked, keep reading, you just might. On Sunday (on Facebook) a post appeared from a certain author (guess who?) discussing spaghetti pie. And then it turns into Waffled Spaghetti Pie. Yes, Spaghetti Pie in the waffle maker. Pecorino Romano AND Provolone cheeses? Oh, yes. . . .
No, I’m probably not going to try it unless I decide to pop for gluten-free spaghetti. Well, now that I think about it, I just might. That looks pretty darn good, doesn’t it? Taste tester and friend of the blog Neighbor E was given some fresh garden produce recently, and he gave me some of it because he wouldn’t be able to use it before it went bad. The carrots nearly as big as my forearm were used in some stewed lentils, which I’ll talk about in a future post. (He and Neighbor R loved that one.) Since I don’t normally buy potatoes because of the high starch content, I didn’t use them right away, just thinking about what I might do with them. Then it hit me: hash browns. But not just any hash browns. 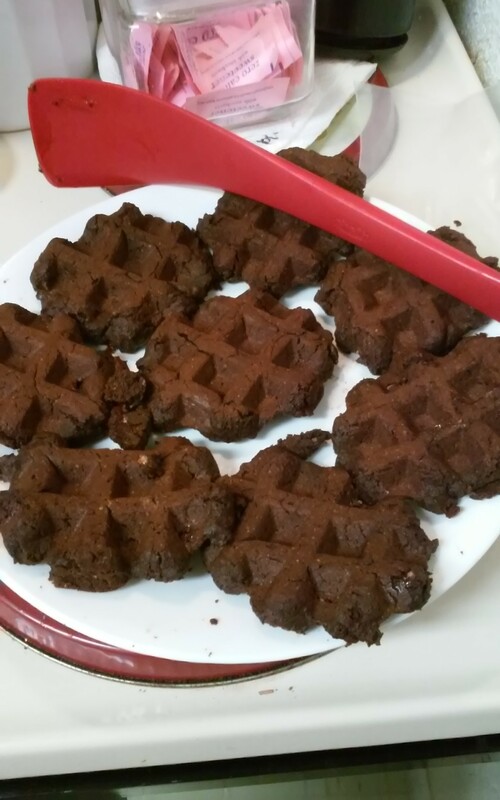 You may have seen the Pinterest or Facebook post showing you how to create them in a waffle maker from frozen tater tots (and I talked about that the first time I brought up waffling.) Unless you’re in Denny’s or some other high-end restaurant (yes, that’s sarcasm), you’re probably not going to be able to get them nice and crispy making them from scratch. So, I cracked open the new holy grail of appliance cooking, Will It Waffle? 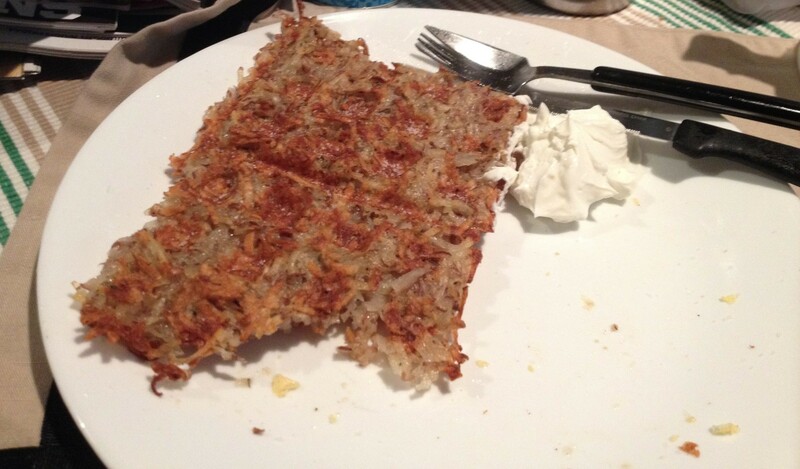 and sure enough, there’s a waffled hash brown recipe. With fresh rosemary from the HeatCageKitchen garden! Really, it’s a bit of work, but simple. You shred up the potatoes, either by hand or with a noisy machine. Here’s the trick: you must remove as much of the water as you can. My way was to use this long-forgotten over-the-sink colander, spread them out, then blot and squeeze with paper towels. I think I bought that before I met the GER. I am now out of paper towels. Quarter teaspoon of salt, half teaspoon pepper mixed with half a teaspoon finely chopped rosemary. Sorry about that. I only have two hands. But cook it as long as you need to, until it’s crispy the way you like it. I actually cooked that one a little more so it would get crispier. Once it’s done, take it out and cook up hot, puffy scrambled eggs right behind it. Breakfast! When it’s ready, serve it with ketchup, sour cream, salsa, or whatever you like on your hash browns. I normally don’t have sour cream around, but because I’d made coleslaw earlier in the week, I had some. No, hash browns are not on my regular rotation, but someone gave me potatoes, so I figured out the best use for them. Delicious. How come we didn’t think of this before? Well, Daniel Shumski did, and we are all grateful for his expertise, too. Got some potatoes? Get out your waffle iron and start making hash browns. Even just once, you’ll enjoy the heck out of it, but I bet it won’t be the last time. Breakfast,Cookbooks,Fast & Easy,The Slow Cooker,The Waffle Maker,Tools of the Trade,Trends Martha Stewart Living,potatoes,waffle,waffle iron,waffle maker,Will It Waffle? Breakfast,Considered opinions,Cookbooks,Desserts,Fast & Easy,Ingredients,New Trends,The Waffle Maker,Tricks of the trade,What's for Dinner? Breakfast,waffle,waffle iron,waffle maker,Will It Waffle?